The components of each developmental adaptation in postural control must be analyzed and understood by the therapist so that the child is given specific help in mastering those components or controls that have been missed in appropriate postural alignments. This is part of the initial observation of the movement responses made by the child. It is helpful to understand the specific postural controls that are mastered during different stages of development to be able to analyze the missing skills in the older child. 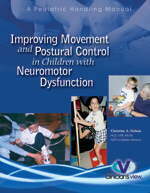 By controlling variations in the child's base of support, the therapist gives the child more options for movement.